As the debate over aliens using earth as an interstellar port rage on, the breakdown in protocols continues when a murderous alien wreaks havoc outside of the containment zone. This new arc puts the focus on the ESA officers themselves as the conflict escalates. Issue 5 picks up where the last issue left off and the fallout has been devastating especially on officer George Rice. His reluctance to heed his partner's warnings about dealing with the dangerous fugitive cost him the love of his life. Writer Zack Kaplan allows him to monologue his grief and pain which feels refreshing in allowing him this vulnerability. They've been through a very traumatic experience and because of it have been reassigned for the time being. Elsewhere, secretive meetings are taking place among Consortium business partners, presumably to address the recent escalation of domestic terrorism at the hands of the aliens. There is still plenty of unease and tension in the air. There's anticipation of another attack that's palpable. There is nothing wrong with this approach so far from Kaplan however it seems to be more of the same. 'Port of Earth' is still a thrilling sci-fi story but by this point, we should have more answers than questions about exactly what is prompting these alien attacks. So far, we don't really know enough about this world, the Consortium, and who these aliens are. We've been following Rice and his gung-ho partner Eric McIntyre and know their story but there's an imbalance by keeping readers in the dark about other forces driving the plot behind the scenes. What aliens are doing the attacks and what could be their motive? What do they want? We have not learned much about the members of the Consortium. There's just a lot of questions lingering in the air that could weight to the series of attacks, perhaps revealing what is at stake. Andrea Mutti and Vladimir Popov continue to create a gritty, sketchy, and subtly colored world. Mutti, for the most part, has had to make tight quarters look distinctive. It's not easy having your characters maneuver through countless hallways and other interiors and make them stand out. Here, Mutti shows us more exterior images of the port adding some scope and futuristic details. As usual, the action and alien designs are creative and propulsive. 'Port of Earth' remains exciting and unique but after one arc we could use more information and details. It's time to expand this universe by adding more context from different first-hand characters. The cable news debates are compelling but getting the perspective from aliens or other officials could open the series up further. 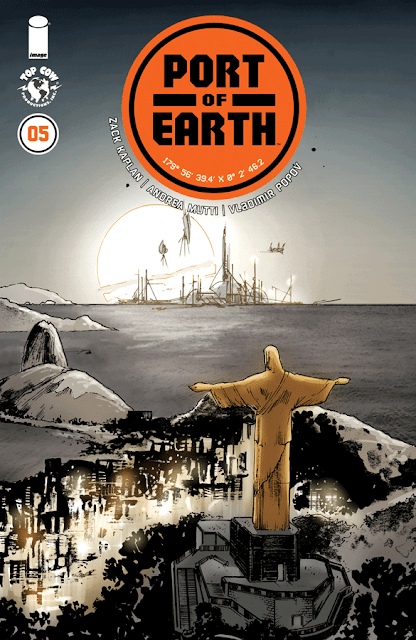 Nonetheless, 'Port of Earth' is consistently engaging and surprising just in need of some more world building.